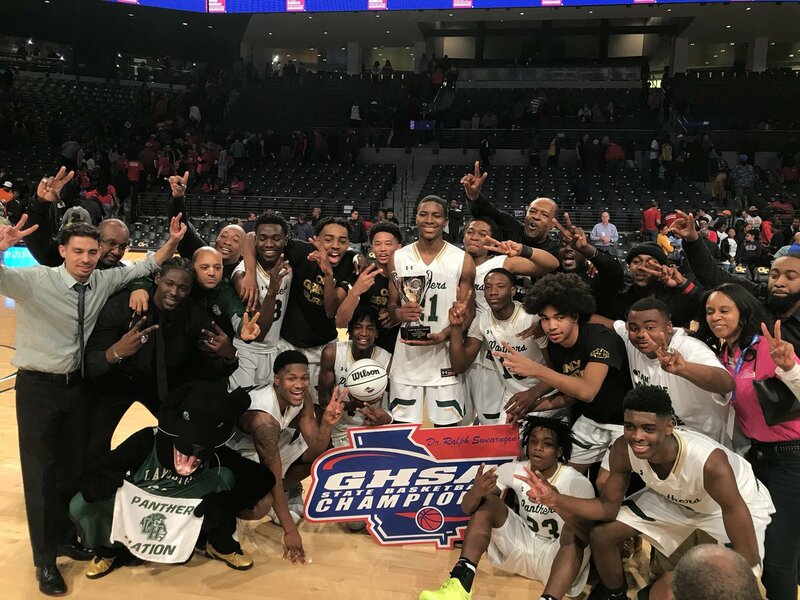 (G) R4 #1 Laney 63, R4 #2 Josey 40 The Wildcats ripped off a 12-0 run after trailing 16-15 to find the cushion they needed to blow past Josey for a fifth time this season and win their second-straight state title and 62nd game in-a-row. Alabama-signee De’sha Benjamin was unstoppable with 19 of her game-high 26 points in the first half when it mattered most. She finished with 11 rebounds, 4 assists, 3 steals and 2 blocks. Laney led 29-20 at the half, holding the Eagles to 22.7% shooting. Jhessyka Williams tacked on 19 points, 11 rebounds, 2 assists, 2 steals and 2 blocks. Jaiden Hamilton tallied 14 points, 5 rebounds and 4 assists as the third head of the Wildcat attack. Josey finished just 29.5% from the field and 3-of-14 from deep. Tykedra Rolland (10) and Rhykeria Rolland (7) were held to 17 points total. Ebony Clark led the Eagles with 12 points and 7 rebounds. (B) R1 #1 Thomasville 66, R2 #3 Vidalia 31 It was a blood bath from the opening tip as the bigger and more athletic Bulldogs ran wild with a 13-0 start. Sloppy Indian ball-handling led to turnovers while lazy transition defense accounted for six Bulldog first half dunks. The Indians shot 4-of-24 from the field (16.7%) and 1-of-14 from deep in the opening half as the Bulldogs led 41-10 at the break. McDonald’s All-American and Mississippi State-bound forward Reggie Perry finished with 17 points, 8 rebounds, 5 assists and 4 blocks. Vonterius Woolbright added 17 points, 7 assists and 3 rebounds. Titus Wright had 11 points, 5 rebounds and 2 blocks. Vidalia was led by Tahj Jones’ 10 points. The Indians finished 2-of-25 from three. Thomasville outscored Vidalia 40-20 in the paint and had 22 points off turnovers. (G) #4 Greenville 73, #3 Marion County 52: While Marion County came out double-teaming reigning Class A-Public Player of the Year and Mississippi State-signee Brittany Davis, the rest of the Lady Patriots picked up the slack, helping Greenville grab a 21-10 first quarter lead and building it to 43-26 at the break. Davis finished with 30 points (5-20 FG; 19-20 FT) 11 rebounds, 3 assists, 3 steals and 1 block in her final game. Freshmen Shabrica Leslie and Jabrika Leslie came up big, Shabrica posting 14 points and 5 rebounds while Jabrika had 12 points. Nuriyah Slaton finished with 8 points, 16 rebounds and 5 steals. The Lady Patriots grabbed 24 offensive rebounds and put up 26 second-chance points. Greenville out-rebounded the bigger Eagles 54-46. Marion County was led by Torriunna Myers’ 15 points. Jameisha Williams chipped in 8 points. Ansley Whitley battled for 7 points, 18 rebounds, 3 assists and 3 blocks. 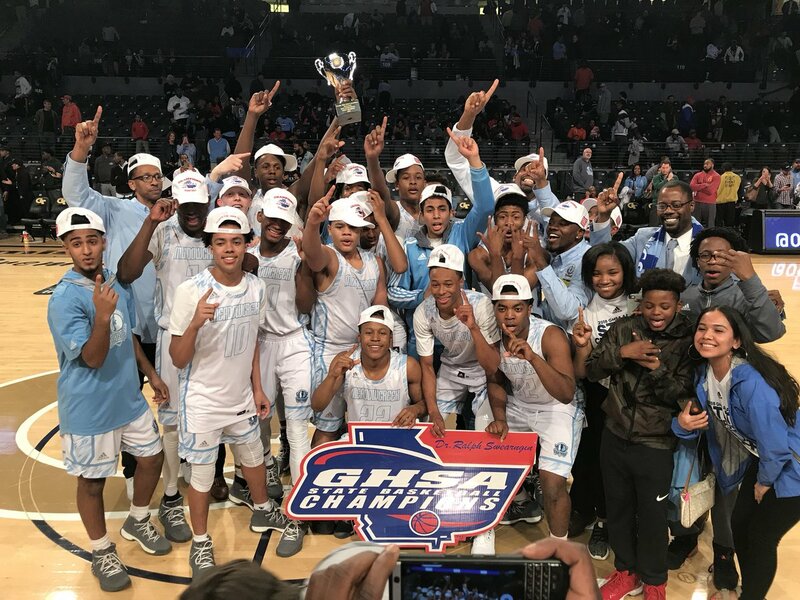 (B) #3 Wilkinson County 71, #5 Montgomery County 68: The Blue Storm took over the Macon Centreplex again, as the Warriors completed the three-peat, captured their 10th state title in school history and their sixth in the last eight years. 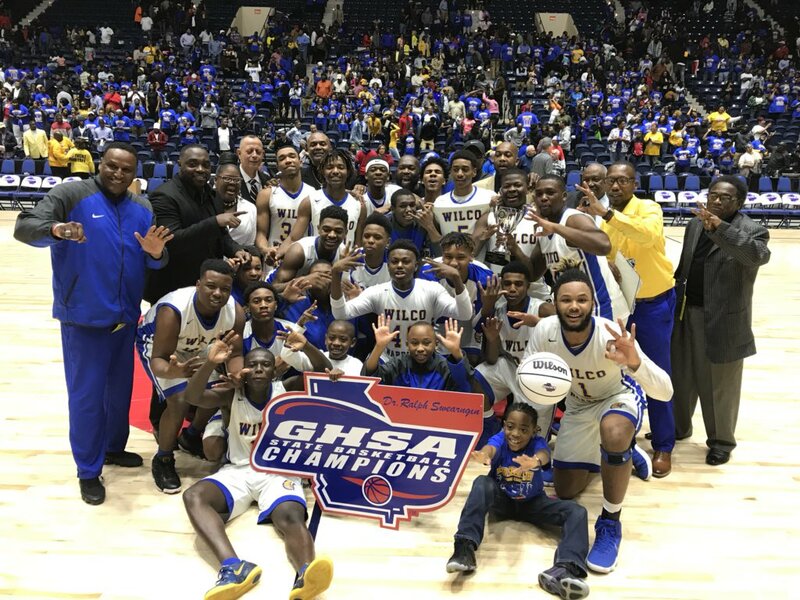 Wilkinson County survived a gutsy performance from senior wing Jahleel Wilson who nearly willed the Eagles past the Warriors who are now 10-0 in state title games. Wilson had 27 points, 6 rebounds and 6 blocks as he carried the Eagles. Daveaun Coglin finished with 19 points but shot 7-of-24 from the field while Shaw Robinson, who scored 22 in the Final 4, finished 2-of-11 from the field with 5 points. Wilkinson County showed they could play a fast pace game, running up and down with the Eagles in the first quarter, taking a 21-18 lead after one. The two teams entered the half tied at 38. 6-foot-6 senior center Tylan Grable came off the bench to give Wilkinson County 11 points and 14 rebounds. Montgomery County fell behind 62-54 at the 2:44 mark of the fourth quarter but Wilson powered the team back into it, getting help from Daquan Jackson who netted two late hoops. Robinson came away with a steal and a layup to cut the lead to 67-66 with 29.2 seconds left. Having to foul, the Eagles sent Raequan Smith and Brandon Mayes to the line, who went 4-for-4. With 10.7 seconds left, Coach Christopher Owens drew up a three-point look for Robinson, who struggled all night. The guard that averaged 19 points per game on the season, shot an air-ball, sealing the Eagles’ fate. 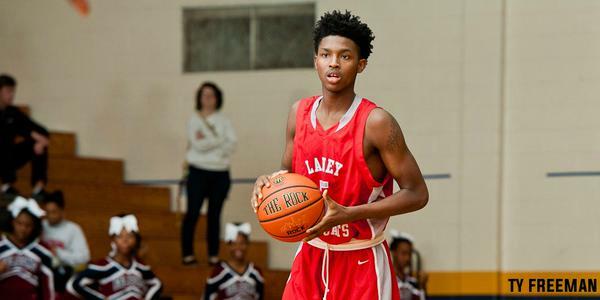 Wilkinson County was paced by Jaylen Lamar’s efficient night, shooting 9-of-14 from the field for 22 points. Devin Jones chipped in 12 points and 4 assists in the win. Montgomery County out-shot the Warriors 72-to-50, but Wilkinson County sank 50% of their shots while Montgomery connected at a 36.1% clip and just 3-of-18 from three. 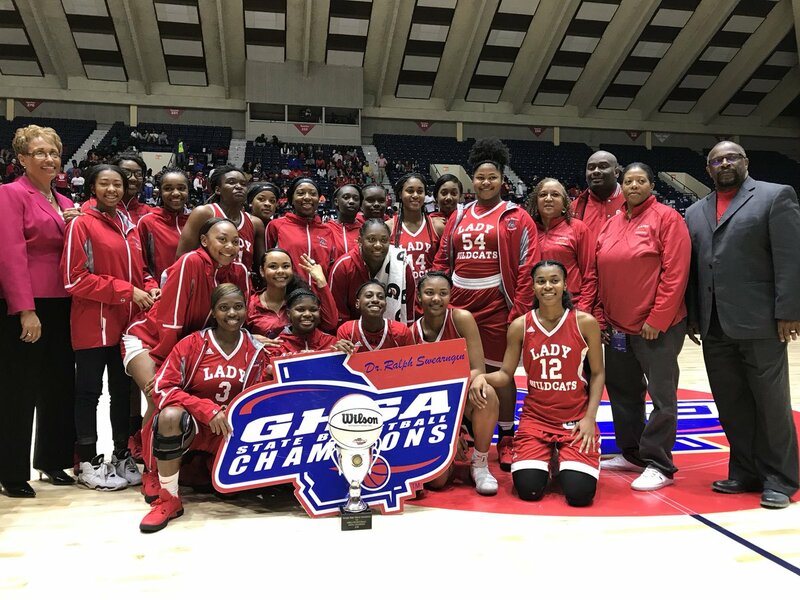 (G) R3 #2 Johnson-Savannah 62, R7 #1 GAC 50: The Atomsmashers atoned for last year’s state title game flop by locking down the paint and shutting down a potent GAC offense with three D-I commits. 6-foot-5 senior Giana Copeland swatted 7 shots in the first 6-plus minutes of the game and finished with 3 points, 12 rebounds and 12 blocks total. GAC shot 1-of-15 in the first quarter and just 22.1% for the entire game. Down 52-39 in the fourth quarter with 2:27 left, the Spartans finally made their move, sparking a 9-1 run to close to within 53-48 with 1:27 left. But from that point on, Bubbles Williams, J’Mya Cutter and Jasmine Thompson combined to go 9-of-10 from the line to ice it. Cutter finished with 19 points and 6 rebounds while Thompson added 13 points and 8 rebounds. Williams finished her career with 12 points and 4 assists. Caria Reynolds (Hofstra) led GAC with 13 points and 11 rebounds on 3-of-15 shooting. Taylor Sutton (MTSU) scored 12 points on 5-of-15 shooting and Wofford-bound forward Mary Martha Turner had 6 points and 18 rebounds. Kennedi Williams gave the Spartans a spark at guard with 10 points and 7 assists. (B) R7 #1 GAC 67, R3 #2 Jenkins 53: The Spartans turned a 25-20 halftime deficit into a state title under alumnus David Eaton. Ben Sheppard keyed a 24-point third quarter by sinking two of the Spartans’ four trifectas in the frame. Sheppard scored 8 of his 15 points in the quarter as the Spartans edged ahead with a 44-38 lead and would never trail again, bouncing back from a 15-1 run that gave Jenkins the lead at the half. Hunter McIntosh iced the game from the line in the fourth quarter, scoring 14 of his game-high 19 points in the final eight minutes including finishing 14-of-19 from the stripe. Michigan football-commit Chris Hinton piled in 12 of his 16 points in the second half and collected 4 rebounds and 4 assists in the process. Roy Dixon scored 13 points to help the cause. Jenkins was led by Sai Fisher’s 12 points and Mye’on Williams’ 11 points and 6 rebounds. Matthew Sams netted 10. 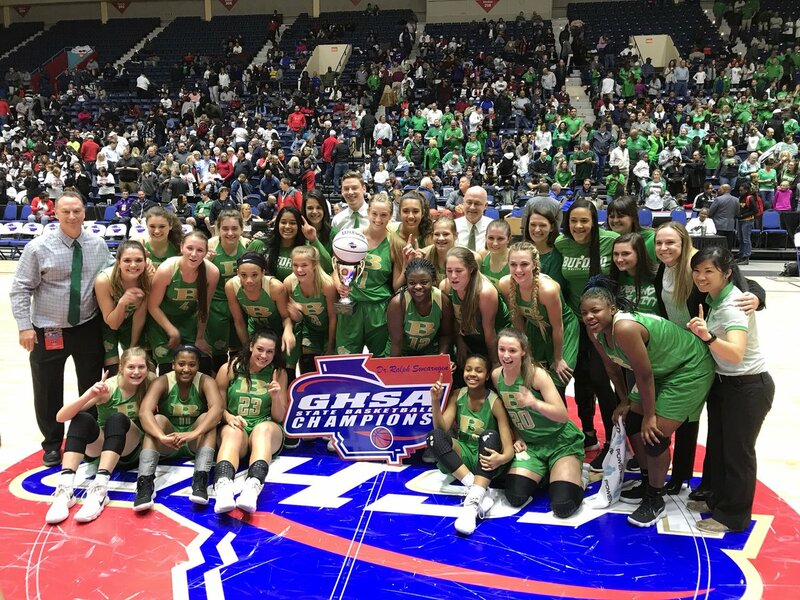 (G) R8 #1 Buford 60, R8 #2 Flowery Branch 49: Buford defeated Flowery Branch for the fourth time this season and seventh in the past two years as the Lady Wolves repeated as state champs and won their sixth title in school-history. Buford held Flowery Branch under the magic number of 50 — all three of the Wolves’ losses this season coming when they allowed over the half century mark. Michigan State-signee Tory Ozment poured in 15 of her game-high 28 points in the first half to go along with her 7 rebounds and 5 assists. Ebony Grant added 12 points. Flowery Branch was paced Alabama-signee Taniyah Worth who finished her career with 18 points, 14 rebounds and 4 assists before fouling out with 1:11 remaining down 60-48. Caroline Wysocki struggled from the field going 1-of-7 to finish with 10 points. 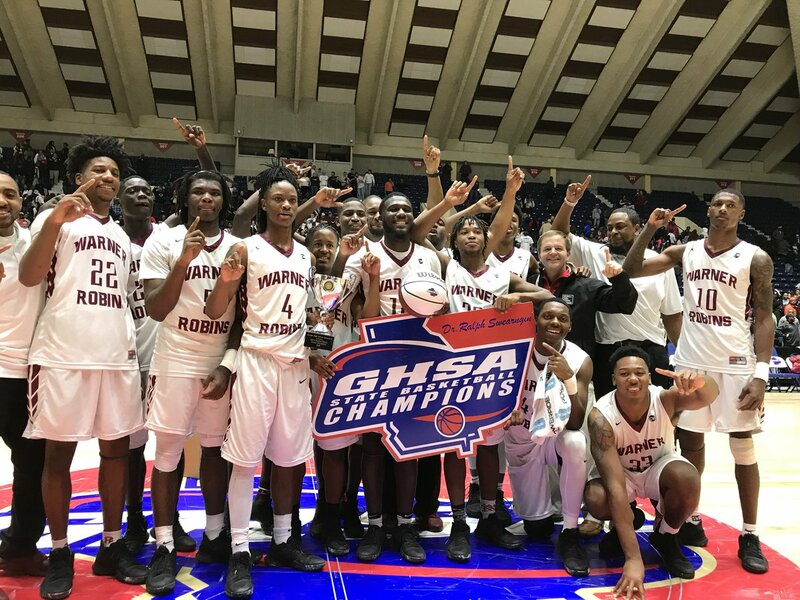 (B) R1 #1 Warner Robins 67, R5 #3 Miller Grove 64: In a tug-of-war game to finish a less than competitive week back at the Macon Centreplex, Jacolbey Owens drilled a three with 1.3 seconds left to give Warner Robins their first-ever state championship. Miller Grove got off to a hot start, up 15-6 in the first quarter behind eight quick Lorenzo Anderson points. At the end of one, the Wolverines held a 15-10 lead and kept Georgia State-commit Nelson Phillips scoreless. Phillips scored his first basket at the 5:31 mark with the Demons down 19-14 in the second quarter. At the half, Miller Grove maintained a slim 31-29 lead. While Phillips was 3-of-8 from the field, Jacolbey Owens led the charge with nine points but shot just 3-of-7 from the line. In the third quarter, Phillips flew in from the left baseline corner to throw down a one-handed put-back jam to push the Demon lead to 39-35. A Jaydon Norman layup capped a 12-2 run for Warner Robins, giving them a 43-35 lead at the 2:44 mark. The Demons carried a 51-44 advantage into the final frame, but Miller Grove would not go away. After a quiet third quarter, Anderson scored 8 of his team-high 19 points in the fourth. With 2:33 left on the clock, the Wolverines caught up to the Demons at 60-60. Owens was sent to the line where he was 3-of-10 at the time and as a team, Warner Robins was 18-of-32 at that point. Owens sank both free throws and did the same at the 1:54 mark to make it 64-60. The Demons finished 22-of-36 from the line (61.1%) while the Wolverines didn’t fare much better at 66.7% (16-of-24). Down four, Anderson got to the line and converted both attempts. Less than a minute late, Maurice Harvey, who finished with 14 points, 10 rebounds, 6 assists and 2 steals, did the same, knotting the game up at 64 with 51 seconds remaining. The Demons held for one shot. Instead of getting the ball in the hands of star Nelson Phillips, who finished 6-of-15 for 16 points and 10 rebounds, Coach Jamaal Garman saw Owens control their destiny. Owens went to his left, pump faked, and sailed a three over the outstretched arm of TJ Stargell, drilling it — Warner Robins’ only made three of the game (1-for-11) — sending the crowd into a frenzy. Warner Robins went out to celebrate, but the Wolverines got a second chance at life, as the referees added 1.3 seconds back on the clock. 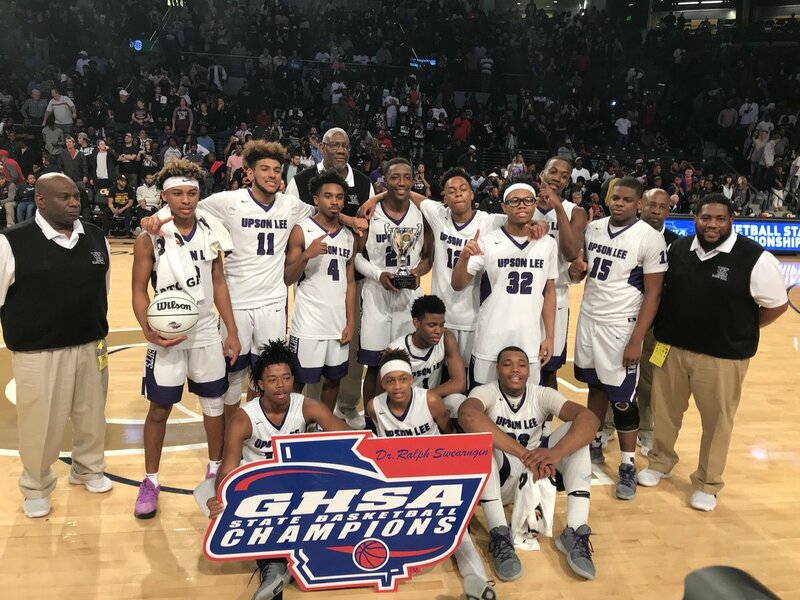 Miller Grove’s final inbound heave was fumbled away, giving the Demons a state championship just 21 miles away from home. Owens finished with 24 points, 4 rebounds and 4 assists. Jaydon Norman added 13 points and 5 rebounds. The Demons collected 18 points off turnovers and out-rebounded the larger Wolverines 43-to-36, grabbing 22 offensive rebounds. Miller Grove received 11 points from Terrence Edwards and 7 points, 7 rebounds and 2 assists from TJ Stargell. 4Q; 1.3@WRDemonBB 67@MillerGroveHoop 64@lill_kyriee THE GAME WINNER?!?!! (G) #6 Wesleyan 61, #1 Holy Innocents’ 44 After beating the Wolves three times in the regular season, Holy Innocents’ kryptonite rared its ugly head again on the biggest stage. 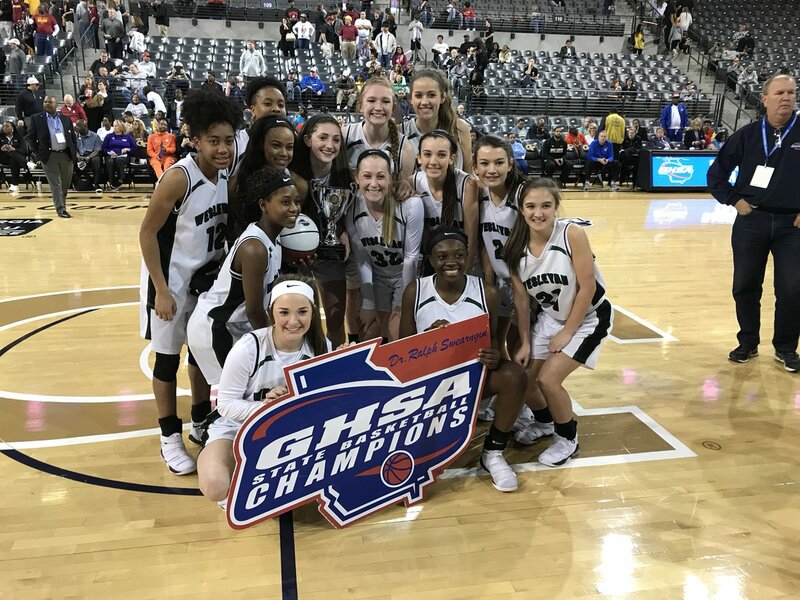 After blowing a 17-point lead last year in the title game, this time the Golden Bears trailed through out and lost to Wesleyan for the third time in the past four state championships. The Wolves’ repeat was led by Furman-signee Sutton West’s 17 points and 8 rebounds. AC Carter had 14 points and 11 rebounds. Old Dominion-signee Amaya Register scored 12 points and freshman Paige Lyons added 10 points and 6 rebounds. UGA-signee Kaila Hubbard finished her Holy Innocents’ career with 18 points and 4 rebounds. Jada Farrell had 13 points and 9 rebounds while freshman Jillian Hollingshead tallied 5 points, 16 rebounds and 3 blocks. Kennedy Suttle, a Penn-signee that had 16 points and 13 rebounds in last year’s final, was held to 4 points and 7 rebounds. As a team, the Golden Bears shot a woeful 27.1% from the field. 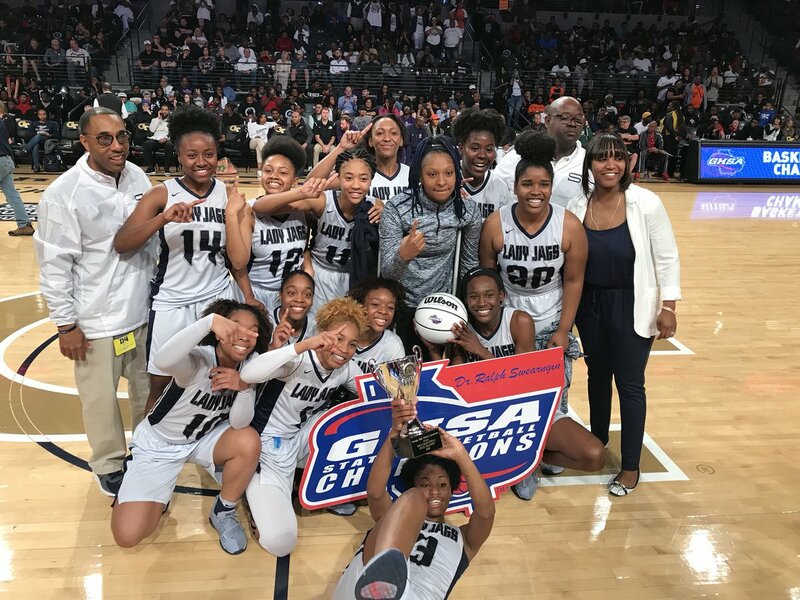 (B) #6 Aquinas 65, #4 St. Francis 60: St. Francis missed three three-pointers in the final 33 seconds as Aquinas won their first-ever state title. The Knights led 33-26 at the half, weathering a 12-to-4 foul count and a 13-of-15 free throw shooting effort, but in the third quarter, the game came to a screeching halt. The Irish outscored St. Francis 25-to-9 in the third as both Tre Gomillion and Trent Bowdre scored 8 apiece in the quarter. As a team, the Irish connected on 10-of-12 field goals in the third after shooting 6-of-19 in the first half. Aquinas controlled a 51-42 lead heading into the fourth. Dwon Odom scored nine of his game-high 22 points in the quarter. At the 6:47 mark of the fourth quarter, the Irish held a 55-48 lead. The Knights fought back and cut the deficit to 61-60 after Odom collected a steal and drained a three-pointer in transition with 48.7 remaining. The Knights had Daniel Parrish trapped in the corner on the press, but were called for a foul that sent the South Carolina move-in to the line. Parrish missed the front-end of the one-and-one, giving the Knights one last look with 8.9 seconds showing on the clock. 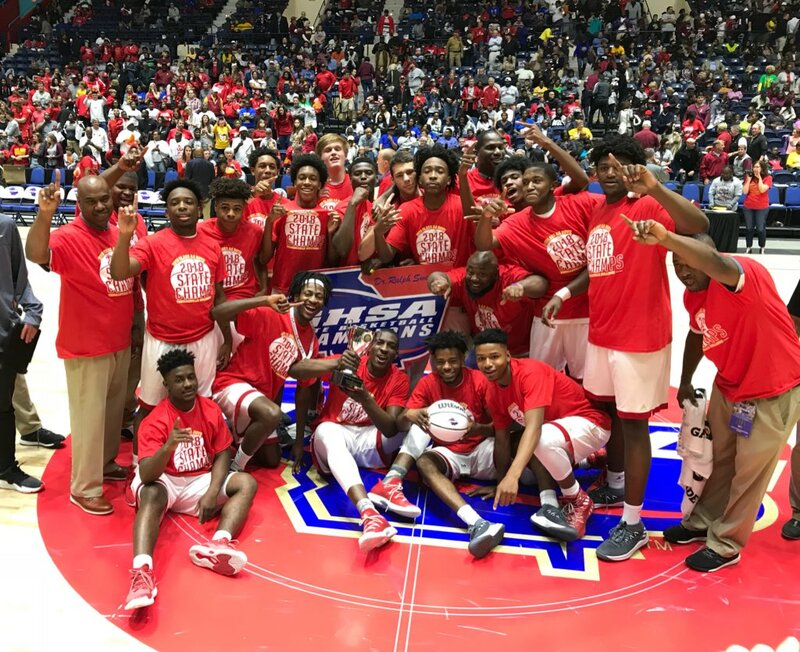 Coach Drew Catlett designed a misdirection play that found CJ Riley open in the corner for a good look, but his three-pointer was off and Parrish secured the rebound, knocked down both free throws and clinched the title. As a team, the Irish went 24-of-27 from the line. St. Francis opened up 15-7 in the first quarter going 4-of-9 from deep, but finished just 6-of-26 for the game. Gomillion led Aquinas with 16 points and 14 rebounds after having just four points at the half. Dajuan Hill added 15 points and 5 rebounds while Parrish (14) and Bowdre (10) each hit double figures. Riley finished with 18 points and 4 assists for the Knights. Chase Ellis was quiet with 10 points. 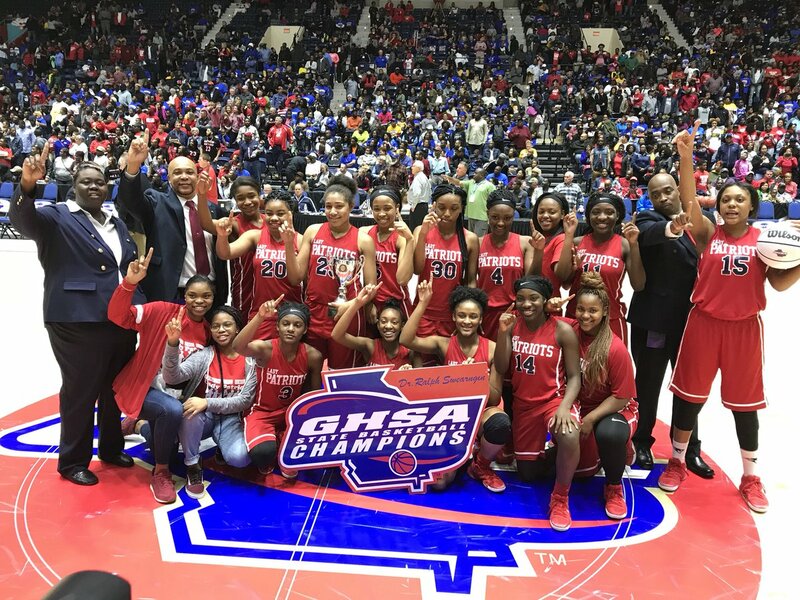 (G) R4 #1 Lovejoy 57, R6 #1 Harrison 41: Lovejoy used a 12-0 run to start the fourth quarter, outscoring the Lady Hoyas 23-to-5 to gain control and win their first-ever state title. After being held to 1-point in the first half, Genesis Bryant scored nine in the third quarter to spark the Wildcats, but Lovejoy still trailed 36-34. In the fourth quarter, it was fellow sophomore Anaya Boyd’s turn to carry the load. Boyd finished with 20 points and 5 rebounds, scoring nine in the fourth quarter. Bryant finished with 14 points. Avanna Preston scored 8 points while Kayla Brown collected 8 points, 13 rebounds and 2 blocks. The Wildcats cut down on their turnovers after committing 12 in the first half and finished with 16 on the night. Harrison turned it over 17 times, seven times in the second half. The Lady Hoyas were led by GCSU-signee Harper Vick’s 10 points and 4 assists. Sarah Woghiren had 8 points and 7 rebounds. Eastyn King and Amara Newsom each had 6 points. UAB-signee Audrey Jordan fouled out and was held to just three shot attempts, finishing with 4 points, 5 rebounds, 2 assists and 2 steals. (B) R5 #1 Langston Hughes 85, R8 #1 Gainesville 78: In front of alumnus Deshaun Watson, Gainesville led by as many as 14 points at 42-28 at the 2:05 mark of the second quarter and carried a 45-38 lead into the half, but the Panthers of Langston Hughes would not be denied, as Coach Rory Welsh and company repeated as state champs. Saddled with foul trouble the entire game, the Red Elephants were able to control the tempo and slice up the Panthers defense in the first half. Kajuan Hale scored 13 of his 15 points in the half while Gainesville made Virginia Tech-signee Landers Nolley work for everything he got, scoring 16 points but also facilitating with five assists. Down seven points, Langston Hughes needed players other than Nolley to step up. Tyrel Morgan scored eight of his 14 points in the first half to provide support, but Tyler Smith was quiet with just three points and two rebounds. Following a dormant opening 16 minutes, Smith brought a spark, scoring eight points in the third as the Panthers surged past Gainesville to take a 65-59 lead into the fourth. Gainesville’s final lead of the game came at the 2:16 mark of the third quarter up 57-56. Middle Tennessee State-signee KJ Buffen scored all 13 of his points in the first half but sat in the second with foul trouble, only managing to take two shots in the second half. Not tested since their 83-81 comeback win at Buford on January 20, the Red Elephants faced adversity for the first time in a long time. At the 1:47 mark of the fourth, Langston Hughes captured their largest lead of the game at 78-67 after a Tyler Smith And-1 and a technical foul on Brent Kelly that gave Nolley a pair of freebies. Instead of rolling over, the Red Elephants fought back in Coach Benjie Wood’s final game on the Gainesville sidelines. Bailey Minor completed a 4-point play, Hale split a pair of free throws and Rafael Rubel finished a layup to make it 78-74 with 1:13 remaining in the blink of an eye. Rubel would then add a three to make it 80-77 with 48 seconds to play, but that would be as close as the Red Elephants would get as Langston Hughes went 8-of-9 from the foul line in the fourth quarter. Nolley finished his illustrious career with three state titles — two in Georgia and three in a row including a sophomore championship campaign at Curie, IL. 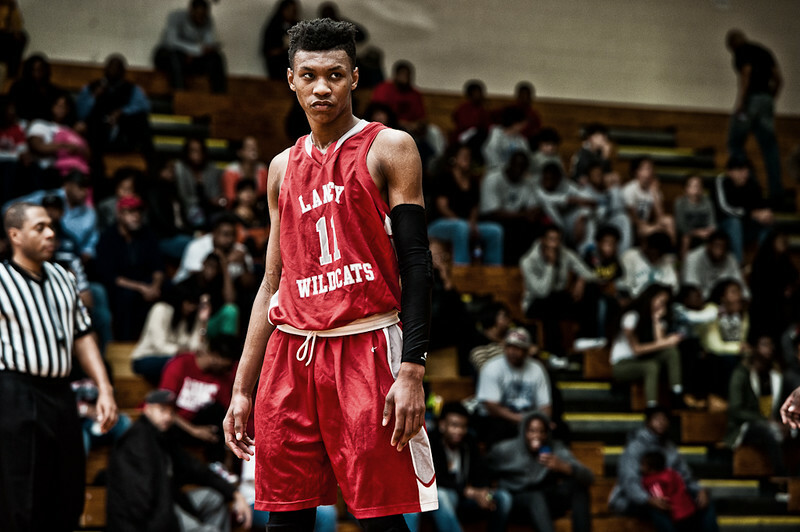 The future Hokie poured in 34 points (17-of-20 FT), 10 rebounds and 6 assists. Smith added 17 points. Gainesville was led by Minor’s 17 points. Rubel chipped in 12 points. (G) R2 #1 Spalding 58, R4 #1 Henry County 46: Sophomore forward Corriana Evans exploded for 19 points and 17 rebounds as the Jaguars raced past Henry County. Kirah Milner scored 9 points and Kiana Banks added 8 points and 9 rebounds. In the loss, Auburn-signee Brooke Moore had 21 points. Amaiya Jackson tallied 10 points and 8 rebounds. As a team, the War Hawks shot 6-of-29 from deep and 26.8% overall. 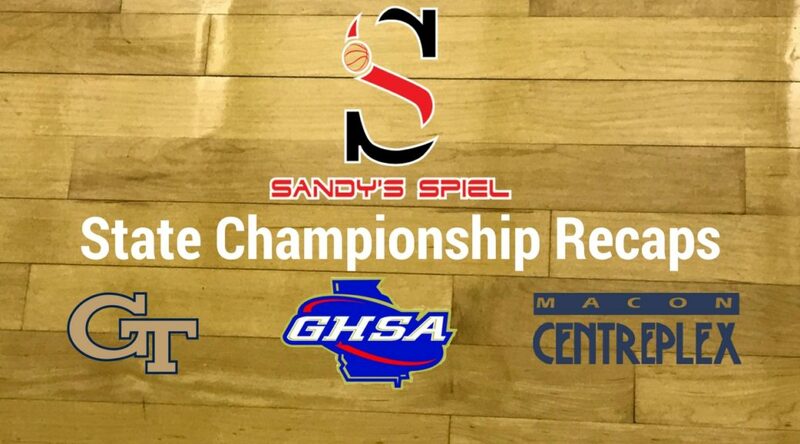 B) R2 #1 Upson-Lee 70, R8 #1 St. Pius X 54: 63-straight. The Knights repeated as state champions, racing past the Golden Lions in the second half after trailing 33-32 at the break. With JaCorey Smith suspended, junior guard Jarrett Adderton stepped up. In his first showdown with the Golden Lions after transferring in from Florida in the off-season, the 6-foot-2 sparkplug provided the Knights with 16 points (7-11 FG) — 10 in the first half — 5 rebounds and 5 assists. St. Pius held their largest lead of the night at 33-25 after back-to-back Everett Lane threes with 1:04 left in the second quarter, but the Knights closed on a 7-0 run, capped by an Adderton block which led to a Tye Fagan layup with two seconds left. The Golden Lions drilled 5-of-14 threes in the first half and got eight points from Troy Stephens. But in the second half, the Knights slammed the door shut, St. Pius going 1-of-9. With the deep ball not dropping, the Golden Lions still harassed the Knights and trailed 44-40 with 1:19 left in the third before a Fagan layup and an Adderton jumper pushed the lead to 48-42 heading into the final quarter. In the fourth, the Knights ran wild as the Golden Lions’ tank was on E. A 14-2 run saw contributions from everyone, growing the lead to 64-47 with 2:49 showing on the clock. Fagan, a MTSU-commit, finished his high school career with 21 points, 10 rebounds, 4 assists and 2 blocks. Travon Walker helped the Knights dominate the paint for a second-consecutive time against the Lions, collecting 11 points, 12 rebounds and 5 blocks as the Knights out-rebounded St. Pius 43-to-28, blocked 11 shots and outscored St. Pius 40-28 in the paint. Zyrice Scott netted 14 points to go with his 4 rebounds and 5 assists. The X-factor in last year’s game, Everett Lane, finished with 11 points to pace the Golden Lions. Cameron Traylor drew the defensive duties and helped keep Lane in check as he took his first shot attempt at the 6:46 mark of the second quarter. Matt Gonzalo had 8 points and 4 assists while Zach Ranson added 9 points. The Golden Lions scored 19 points off 18 Upson-Lee turnovers. The Knights now await a call from the GEICO Nationals. 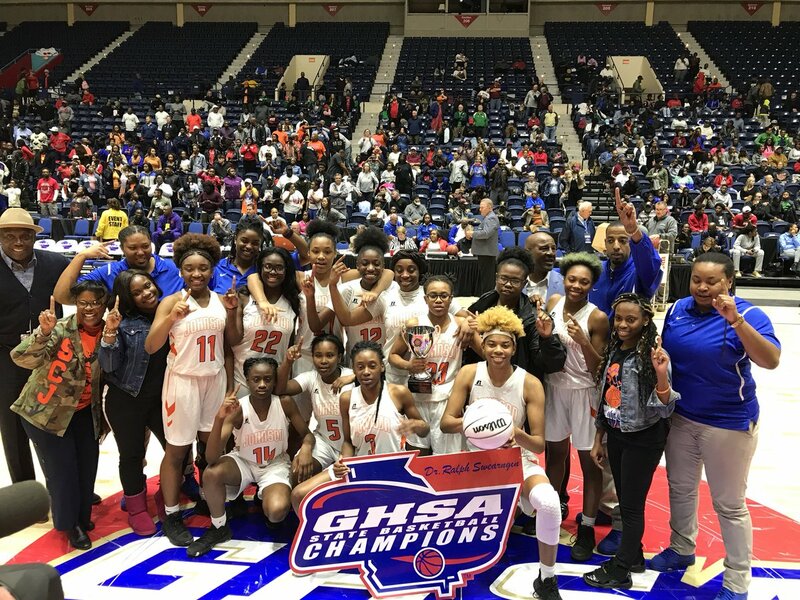 (G) R2 #1 Westlake 60, R8 #1 Newton 45: Westlake led 39-32 at the end of three and pulled away late to claim their first state title. Anastasia Warren poured in 22 points while freshman Raven Johnson had 15 points and 11 rebounds including grabbing her own missed free throw and finishing a bucket inside to put the game out of reach at 50-41 with 1:13 remaining. Taylor Hosendove added 10 points and 6 rebounds. Newton was powered by Jurnee Smith’s 25 points and 6 rebounds. Lexii Chatman added 13 points and 7 rebounds. 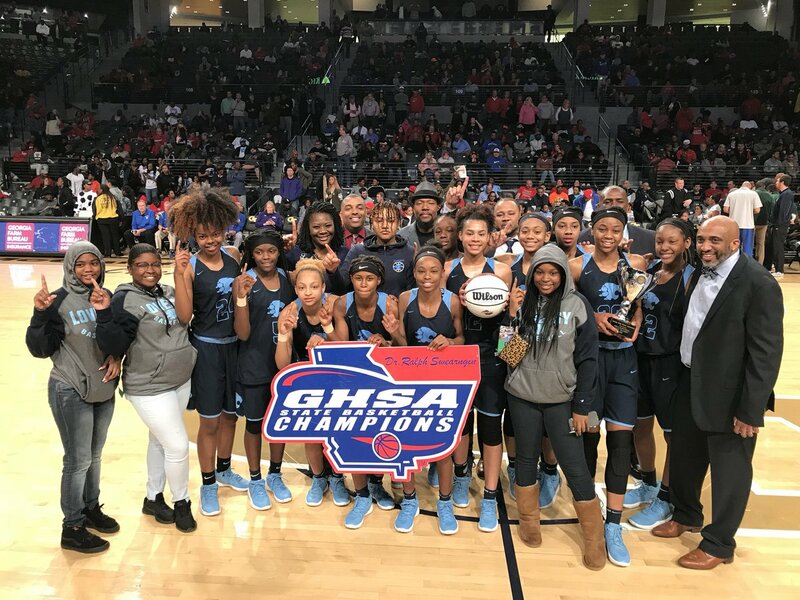 (B) R7 #2 Meadowcreek 56, R7 #1 Norcross 43: For a second straight season, Norcross entered the state title game with momentum and labeled a slight favorite, but again it wasn’t in the cards. 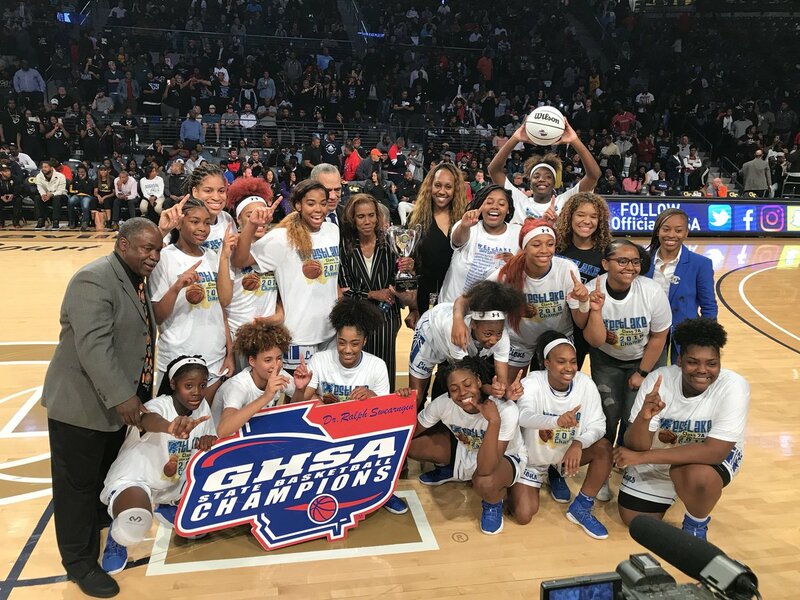 After beating Meadowcreek three times this season, twice on buzzer-beaters, the Blue Devil magic ran out as the Mustangs used a 13-1 run to open the fourth quarter and squeeze Norcross into submission, capturing their first-ever state championship. Dequarius Nicholas scored 10 of his game-high 16 points in the fourth quarter, going 5-of-6 from the foul line. Brandon Boston fouled out at the 6:10 mark with Meadowcreek up 38-37. With Boston’s 13 points on the bench, the Mustangs outscored Norcross 18-6 the rest of the way. Kyle Sturdivant finished with 14 points and 7 rebounds, but his late-game heroics never came into play. Meadowcreek pounded the interior all night, outscoring the Blue Devils in the paint 30-to-16. Duquesne-signee Amari Kelly posted 12 points, 8 rebounds and 3 blocks while Detroit-signee Cory Hightower put up 6 points, 11 rebounds and 4 assists. Meadowcreek closed out the game with a bang at the 1:55 mark as freshman Kedrick Green delivered a behind-the-back pass to Jamir Chaplin for a big slam to make it 46-37. Chaplin finished with 13 points and 5 rebounds while Green added 5 points. Meadowcreek tallied 12 assists on the night compared to just two for the Blue Devils. As a team, Norcross was held to 31% shooting. UGA-signee JoJo Toppin had 8 points and 7 rebounds while Issa Muhammad managed 4 points and 4 rebounds. Norcross shot 1-of-14 from three. As always, the incomparable Chad Cook (@AugBball) was on-hand to witness 3A No. 1 Laney (12-0) and 4A No. 10 Thomson (9-2) in a meeting of two of the Augusta area’s best teams. The Wildcats held on 62-58 at home. Below is the Augusta Guru’s analysis. Be sure to visit his site for more coverage on this game and everything Augusta. No. 1 Laney was on the ropes again, with nearly no hope of coming back, trailing 43-23 after an 18-0 run to the defending state runner-up No. 3 Morgan County, the same team that knocked off the Wildcats a year ago in the state semifinals. Possibly the grittiest backcourt in the state, College of Charleston signee Zep Jasper and Charleston Southern signee Christian Keeling, led the Cardiac Cats with 29 and 22 points respectively. Check out Chad Cook’s AugBBall for full analysis of the game. The Wildcats trailed by 18 before storming back to win in overtime. 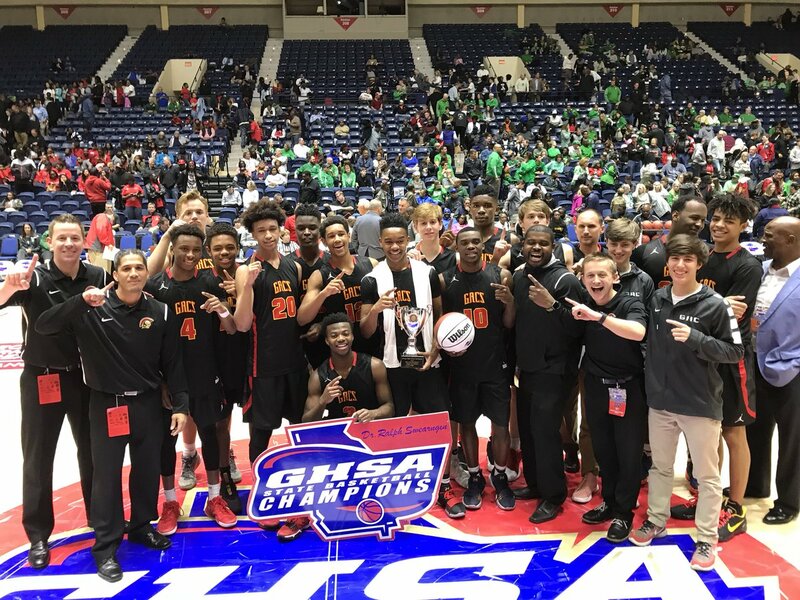 Check below for Chad Cook of AUG BBall’s analysis and highlights and also Wayne Staats of Augusta Chronicle’s piece on the game.